The Pole Model Barn Owl Box offers a cutting edge design that includes a robust rain guard, viewing window in the rear, and removable front for easy cleaning. Its unique double-box system combined with heat reflective pigments and efficient venting keeps the box cool in full sun. It comes with a galvanized-metal mounting-bracket that attaches easily to the top of a wooden 4 x 4, 6 x 6, or to the flange on a metal pole. (We offer our own easy to install telescoping pole kit separately.) All hardware included. Will not rot, will not need rebuilt, and will last indefinitely. 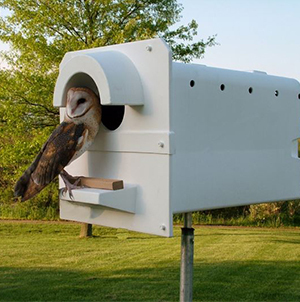 For comprehensive information on barn owls and natural rodent control, visit the Barn Owl Box Company website at www.barnowlbox.com. San Joaquin Sulphur Company is the local distributer for The Barn Owl Box. We have them on display and keep then in inventory.